In this chapter, I won’t address the doctrine of salvation directly. Instead, I will address the theological issues that compel Christians to “go.” In so doing, I will touch on some of the important issues that relate to the doctrine of salvation itself, but an examination of the issues related to a thorough doctrine of salvation will have to be sought elsewhere. God’s love is not great because the world is so large, but because the people who dwell in it are so bad. God calls on his people to be co-lovers of the world with him, and in so doing to extend the love of God to those who have not yet recognized and experienced it in a saving manner. We share the gospel because God loves the world. Our theology of evangelism also entails the belief that God has chosen to save a great multitude of persons. Not everyone who reads this will agree on how to articulate the doctrine of election, but we can all agree that “He chose us in him [Christ] before the foundation of the world, that we should be holy and blameless before him” (Eph 1:4). The result of this election is that a great multitude will be saved, a multitude of “myriads of myriads and thousands of thousands” (Rev 5:11). God’s love is not great because the world is so large, but because the people who dwell in it are so bad. When we think of God’s electing purpose and its relation to evangelism, we should recognize that we are about the task of calling to salvation all of those whom the Lord has known to be his from the foundation of the world (Eph 1:3). It was this truth, among others, that compelled one of the founders of the modern mission movement, William Carey, to work for seven years before he saw a single convert in India; he was convinced that God had people in that land who were his own. Election ought not merely be a debate point, but a central feature of our theology of evangelism, even though it might function somewhat differently depending on how we construe it. We need to expend more energy in preaching for the chosen of the Lord than in debating the doctrine in coffee houses. We need to expend more energy in preaching for the chosen of the Lord than in debating the doctrine in coffee houses. Why is it that people need to be saved? Most foundationally, lost people do not willingly glorify God or submit to the lordship of Christ. the glory of God and the lordship of Christ are the two consuming passions of Scripture’s authors. God created the world to display his glory (Ps 19), and in his resurrection Christ was declared with power to be both Son of God and Lord of the universe (Acts 2:36; Rom 1:3-4). In evangelism, and what results from evangelism, whether in our own neighborhood or around the globe, we bring the greatest glory to God and extend his Son’s lordship. It is not the winning of souls alone that does this, but also what it entails and what follows: the bowing of knees to the Lord and the initiation of a life of worship for those so saved. As the dutch pastor, statesman and theologian, Abraham Kuyper put it, “There is not one square inch in the whole domain of our human existence over which Christ, who is sovereign over all, does not cry, ‘Mine.’” That domain includes the lives of those who do not yet know their sovereign. 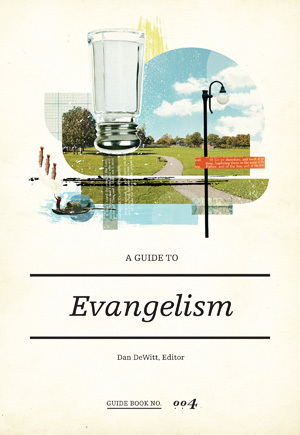 Evangelism also demands an understanding of the spiritual state of those whom we evangelize. In order for lost people to glorify God rightly and submit to the lordship of Christ, they need forgiveness of sins. We evangelize because people are lost in sins and their only hope is the gospel of Jesus Christ. their problem is doubly bad: they are lost, but do not know it. The apostle Paul depicts the response of unbelievers at the time of the second coming as one of total shock. they will say, “Peace and security,” before he comes like a thief in the night (1 thess 5:1-4). Lost people do not know their peril. Some recognize that they have “problems,” and they may employ some self-help, or “religion,” or attempt to make themselves pleasing to God through philanthropy or moral improvement. But the gospel makes clear that such efforts are to no avail. In order for lost people to glorify God rightly and submit to the lordship of Christ, they need forgiveness of sins. Cornelius Van Til once illustrated such efforts by comparing them to a man made of water, trying to get out of a vat of water, by climbing up a ladder made of water. The analogy, someone might say, is ridiculous – but so is the belief that one can save oneself. The gospel message articulated by Paul in Romans 1-4 and in Ephesians 1-2 renders that entirely clear, as do many other passages. Humans also have a fundamental need for a conversion experience. The greatest of all evangelism texts makes this abundantly clear: Go, therefore, and make disciples of all nations, baptizing them in the name of the Father and of the Son and of the Holy Spirit, teaching them to observe everything i have commanded you. And remember, I am with you always, to the end of the age (Matt 28:19-20). We must make disciples, and this most often happens with a gospel encounter and a resultant experience of repentance and faith. Curiously, such a theology of evangelism was absent from most of the church for much of its history. Even with the Reformers’ recovery of the doctrine of justification by faith, they often did not call for a “crisis of faith,” or a specific moment when a person became a disciple. they catechized their children (nothing wrong with that), and believed that the elect among their children (hopefully all of them) would find justification. But it was Anabaptists like Menno Simons and Conrad Grebel in that period who first urged people to repent and be baptized. They were followed in the next century by many Puritans, who spent years “preparing” their children for conversion, so that they might be capable of relating a genuine conversion, become “visible saints” and enter into the full covenant of the church. Then, in the next century it was the revivalists Jonathan Edwards, and especially George Whitefield, who took that to the next level and preached to large numbers, calling upon them to experience the new birth. What is the primary means by which the gospel is set forth? The primary means of evangelism is Scripture. Paul asks, “How then will they call on him in whom they have not believed? And how are they to believe in him of whom they have never heard? And how are they to hear without someone preaching? And how are they to preach unless they are sent? As it is written, ‘How beautiful are the feet of those who preach the good news!’” (Rom 10:14-15). The “him” in whom they must believe is the “him” of the Gospel narratives, the one predicted and anticipated in the whole old testament, the one explained and commented on in Acts and Epistles, and the one who appears in all his radiant glory in the book of Revelation. The “him” in whom they must believe is the “him” of the Gospel narratives, the one predicted and anticipated in the whole Old Testament, the one explained and commented on in Acts and Epistles. D. Martyn Lloyd-Jones asserted, “Preaching is the greatest and highest and most glorious calling to which anyone can ever be called.” He was not thereby exalting the ministry to a higher vocation than, say, a butcher or a baker, but was saying that proclaiming the Word is the greatest thing any of us can do. And it can be done by those who are not ordained “clergy.” it is in fact the task of all Christians (1 Pet 3:15). One of the reasons we need to address this issue of the power of God’s Word to bring lost people to Christ is that so many in our day seek to win people to Christianity by means of entertainment and by resorting only to rhetorical and emotional appeals without sufficient gospel and biblical content. God has promised to use Scripture to dissect the thoughts and intentions of the heart and thereby to change our lives (Heb 4:12), not entertainment or emotional and content-less appeals. Finally, the doctrine that compels us to share the gospel as much and as widely as we can is the return of our Lord. We do not know when he will return, of course, but it could be very soon, so we want to do our part to extend Christ’s active lordship into as many lives as possible in the time we have. We want to do our part to extend Christ’s active lordship into as many lives as possible in the time we have. J. I. Packer, in addressing the question of how we know we are doing biblical evangelism, says this: “The way to tell whether in fact you are evangelizing is not to ask whether conversions are known to have resulted from your witness. It is to ask whether you are faithfully making known the gospel message.” What is that gospel message? It is that Jesus died to save sinners, shedding his blood on the cross as our sacrifice and our substitute. What is the response to the gospel message? It is repentance and faith, faith that Jesus has done all that is necessary to save us. Put your hope in him, the one who is coming soon, remembering that after he comes, judgment follows. Dr. Chad Brand serves as Professor of Christian Theology at Southern Seminary and also as Associate Dean of Biblical and Theological Studies at Boyce College.